Welcome to the first session of the Stephen C. Freidheim Symposium on International Economics. 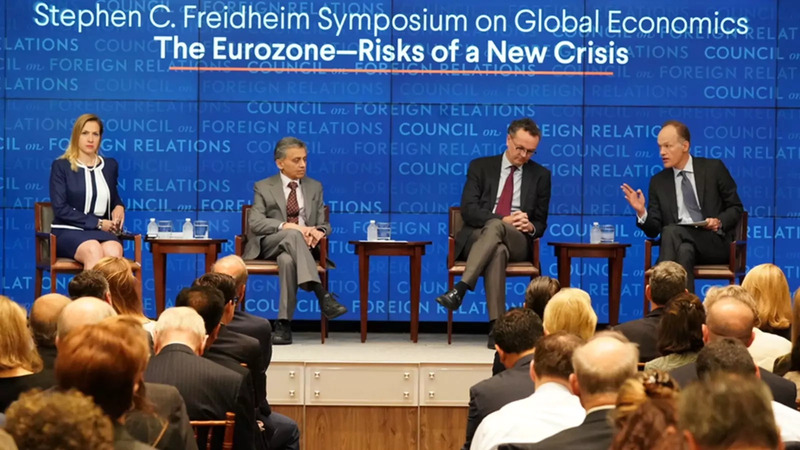 We have three people to discuss the first session, which is going to be “The Risks of a New Crisis in the Eurozone,” and we’re going to discuss the extent to which things have improved in terms of structural stability and where the gaps might still be. We’ve got three people, all of whom have been intimately involved in this debate I think pretty much through the, you know, nine years since Greece first revealed its problems. Is it big enough? Are the rules around it written in such a way that it is danger-reducing? MALLABY: So some of these debates are familiar from prequalification for IMF programs but, I mean, it—boiling it down, good to have it not quite a finished product. I want to move through these issues. I’m going to go to Ashoka with a different one. Another thing which exists now in Europe and didn’t before, I would say, is the sort of whatever-it-takes mentality at the central bank. And the question is here is that a norm that could be unraveled or is it something which you see lasting beyond the transition when Mario Draghi steps down next year and you have a different ECB leader. Do we—can we count on the central bank to do whatever it takes next time? But to reach that point, the country has to go through something called an ESM program. An ESM program, as Jeromin just talked about is the bailout fund. To get the bailout fund, you need to negotiate a program, and a program negotiation can take months. And so while the ECB can say it will do whatever it takes, the ECB will be waiting to do whatever it takes while this program is being negotiated. MALLABY: So just explain one thing. So you are saying that you have to negotiate a program before you get this liquidity from the central bank, but last time around, they just did it. There was no formal negotiation. MODY: Last time around they promised that they would buy unlimited bonds, and investors were satisfied with that promise. But even last time, if the promise had been invoked—in other words, if investors had said, thank you, we’d like our money back, then the ECB would have had to slow down, stop the proceedings, get Spain and Italy to come into a program, then once that program was ready, the ECB would say, yes, we are ready to bail out investors. But even there, there are lots of limitations. The phrase “whatever it takes” is a very cute phrase, and it’s a lovely phrase, and it’s—in the heat of the moment that is what investors were looking for. And so it was a magical phrase. But this magic is a very sort of—a dicey magic because if it works, it works like a beauty; and if it doesn’t, it falls apart. MALLABY: Well, let’s just—so I want to maybe get Isabelle to comment on this, but I have a very clear memory of coming to this stage and doing one of our World Economic Update meetings and saying to people, whatever it takes, isn’t this just a bluff? Why do the markets believe it? And the answer from the market participants on the stage was essentially that, well, Merkel has said that she is going to back it, and it was the sense of political commitment behind the central bank which really made Draghi’s promise credible. MALLABY: Yeah, exactly. So therefore, next time one couldn’t count on it. But Isabelle, do you want to comment on that? But I think more importantly, perhaps, there’s this focus on the sovereign going bust. What we’ve learned from looking at the Greece case is that death comes from the banks. And the same thing could happen in Italy, because once the spread on sovereign that goes high enough the banks lose their ability to roll over very quickly, they run out of money. And we saw it in Greece. The ECB had to pull the plug. And that’s nothing to do with the ESM, and I think that’s the channel that is still not sufficiently focused on. And I think the system as it stands right now is absolutely not prepared to deal with it. MALLABY: So we’ll come back to the banks, but I think what we’re seeing is that both on the creation of the ESM that Jeromin addressed, and on this whatever-it-takes pledge, it’s not an entirely finished structure. But Isabelle, one other thing for you: another thing that’s there and wasn’t there before is the central bank’s supervisory authority, and the idea here is to take some of the decisions around when a bank is insolvent away from national authorities that tend to exercise excessive forbearance and move it to the center, which is supposed to be tougher. How well do you think this is going to work? MATEOS Y LAGO: Well, so that’s been working, I think, remarkably well—or in many ways the centralization of supervision, and if anything what we’re seeing now is that it’s in the areas where we haven’t centralized, like money laundering, that we’re still seeing problems, perhaps linked with forbearance. So that has worked well. Unfortunately, what has happened since the last crisis is we’ve had a fragmentation of the European banking system. We have a more fragmented banking system today than 10 years ago despite the SSM. And without a banking union, you don’t have any private sector risk sharing, and so the SSM and all that is always going to be the cherry on top. What you need fundamentally is risk sharing by the private sector. There is no capital markets union to speak of, and we’ve gone backwards in terms of banking union, apart from this centralization of supervision, which is a big step forward, but we’ve done one step forward and three big steps backwards. MODY: —on what Isabelle said, the banks in the eurozone essentially lend within the country. That’s what she means by the word fragmentation. In other words, a German bank is not going to lend to Italian borrowers. And that is because the system as it exists—in the United States a bank will lend to a borrower anywhere in the country. That’s because of two things: one, there is something called the FDIC—the Federal Deposit Insurance Corporation—that insures deposits anywhere. So a bank working in one part of the country does not have to worry about a process of default or runs anywhere in the country. You referred to my book. The first discussion of a eurozone budget arose in 1969, and I’m always—as you—amused when people bring it up as though it’s a new idea. It’s not a new idea because the Europeans are unwilling to do it. But now we’re getting to something like deposit insurance, which was discussed for a long time, but hasn’t actually been created. And there are other things like that which have been on the policy agenda. And gentlemen, I want to come to you on this one. Fiscal transfers across the eurozone, which are necessary to stabilize an economic area which has a single monetary policy, by definition—and this is something I’m sure—a point he makes very well in his book—by definition, of course, one monetary policy is going to be too tight for some parts of that economic area. So that area will be in recession unless it gets fiscal transfers to offset, or unless there is enough labor mobility to offset it. But labor mobility is still I think only half the rate of the U.S. if you look at mobility across states. So Jeromin, talk a bit about this question of fiscal transfers within the eurozone member states, which I know you’ve worked on a lot, and it’s been like stubbing your toe on a brick. OK, so it’s—first of all, it’s really important to remember—and Ashoka really brings this out very nicely in his book—that this whole idea of the euro is based on a grand bargain by which Germany would, you know, give us its currency—this is from the German perspective—hence, you know, essentially as a gift to Europe, this wonderful D-Mark with its stability properties would be shared by everyone. And, you know, it was viewed as in a sense democratizing the D-Mark, and also the D-Mark was dictating monetary conditions in Europe before the creation of the ECB. Now we Germans are going to let everyone to come on our board, in a sense. That was how it looked like from the German perspective. But, you know, only if that was the condition and it remains the condition, and even, you know, liberals or, you know, murky, center-left people like myself agree with that condition—on condition that we are not going to engage in systematic redistribution in the euro area. So the Germans do not want the Euro to become—and this is a consensus that goes from the Greens all over to the AfD—so the black hole through which Germany ends up paying for the rest of Europe. So then the question is, you know—Ashoka, in his book, says, well, but that’s kind of the condition for the euro, for any currency to work. You need those fiscal transfers. And there’s a big debate around it. MALLABY: So you mean if Italy is—if Italy is in recession because of ECB policy, Italy should be able to run its own deficit and do its own stimulus. MALLABY: But don’t expect the Germans to pay. Now, the problem is that the original design of the euro, because of what—I forget what Ashoka calls it, the stability culture or the stability cult, one of the two things—(laughter)—in the euro area, you know, they wanted to prevent also big buildup of debt at the national level because then they thought that the ECB would come under pressure to bail out countries with large debts, right? So, to preserve the stability of the currency, we the Germans also put in these very strict fiscal rules, and those prevented precisely the policy degree of freedom that would have been necessary to combat it. So that we need to work on in any case. And there Ashoka and I agree we need to effective liberalize what countries can do with their fiscal policies and then maybe replace some of the role of fiscal rules with more market discipline. So this is sort of one thing. That’s a work in progress, but I think there is a broad consensus, certainly outside Germany and with some reasonable Germans jumping on that bandwagon, that this needs to be done. Then the second question is, do you need actual fiscal transfers, you know, cross-border? And so here the point that, you know, a group of French and German economists that I was part of that—you know, we wrote a paper to try and sort of get Macron and Merkel to see more eye to eye—was to remind them of the fact that these fiscal transfers, even if you think they’re necessary, they don’t need to be permanent, right? So you can have a risk-sharing arrangement where if you hit a snag, you know, you’re going to be the recipient of fiscal transfers. If the other side hits a snag, the other side’s going to be. And you can calibrate a mechanism that takes into account how much countries—you know, what risk they impose on the system, right? So if you impose a risk—bigger risk on the system, your insurance premia are bigger, in a sense. And if you do this in a good way, you can have insurance without permanent transfers. Why? You have to believe me on this, because if you don’t believe me on this the entire insurance industry would not be commercially viable. (Laughter.) So it must be possible, right? And so this is sort of the technocratic economist solution to Ashoka’s fiscal transfer problem. The problem with that is you need a certain amount of trust for this to work because you need trust in a new institutional setup that in principle can lead to countries paying into some fund for a long time and then maybe never drawing; or maybe, you know, the premia were calculated in the wrong way. So if that’s the case, you do end up with these permanent transfers. And so here the big point that Ashoka and I again agree on, I think, is that by the time we get through all these very aggravating and divisive crises, maybe we don’t have enough trust in the system to make an institutional reform, which on paper would be the answer, and would work, and it would respect the grand bargain, right? It would respect the basic rules. But we kind of need to take a leap of faith, and maybe we don’t have enough faith left in each other to do that. MALLABY: So there’s a lot in that. I want to dwell on this for a second because I think, as you say, Jeromin, it is as the center of the whole bargain. You know, Ashoka, one issue as I listen to Jeromin is that it’s all very well to say, you know, let’s let the Italians run their own budget deficit if they need a stimulus, but if they are allowed to do that, and at the same time they can issue debt with some sort of implicit assumption in the markets that the ECB or the ESM or the system in general is standing behind it, as we saw in that period of the first eight or nine years of the eurozone, the Italians are going to borrow very cheaply. So they won’t have market discipline on how much they borrow. And Jeromin wants to reduce the political discipline because, as he says, these stability rules are preventing the countercyclical fiscal stimulus. So doesn’t that just create a system where Italy ends up borrowing much too much? MODY: It’s an impossible situation. There is—you know, Jeromin has given a technically nice idea. There are so many—so many problems even at a technical level. So just the state of Nevada during the crisis received something of the order of twenty percent of its GDP in fiscal transfers. These are transfers. There’s no paying back. MALLABY: There’s no insurance fund. MODY: There’s no insurance fund. That is the social contract on which the American monetary union works. The Greeks got a loan, which they have to pay back. Now, you know, we celebrate the fact that the Greeks did get a loan. But as a consequence, they have got an economy that is twenty-five percent below its pre-crisis norm. Nevada has a—has gone from an unemployment rate of about fourteen or fifteen percent to four percent. So the adjustment process works in a monetary union where there is a political contract. The fundamental problem always in the eurozone is that there is no political contract. And therefore, every technical solution of insurance funds, of fiscal stimulus, runs repeatedly into this problem of what he generously calls trust, but what in effect is a deep—a deep distrust. So consider the insurance fund idea. The notion is that on this occasion Italy will receive money and on a future occasion Italy will transfer back the money to Germany. The Germans may say hypothetically that is a sensible statement, but when is it likely to happen that the Italians will be—will be required to refund the Germans? Whereas in the United States, the state of Connecticut transfers money every year for the last twenty years, something of the order of five percent of its GDP, to states like West Virginia and such like. It’s part of what the DNA over here is. It’s not—it’s not there in the—in the eurozone. MALLABY: Do you want to, quick? ZETTELMEYER: Well, I mean, first of all, it’s not true that, you know, there is—there is, of course, a notional fund in the U.S. too. It’s called federal taxation and Social Security, right? So it’s also the case that we have to distinguish a little bit two reasons for transfers. One is to support chronically poor and underdeveloped regions. We have this in Europe already, right? And so it may not be large enough, but that’s not what I’m talking about. What I’m talking about is what happens if a region which could well be a rich region—say Massachusetts in the 1980s—gets hit by a big, you know, adjustment problem, and in that case it will draw money through the federal insurance mechanisms, and then it will implicitly repay it back by continuing to pay all the time. So I don’t think this is unfeasible in the eurozone. And you’re right, we don’t have an explicit political contract, but we have an implicit one—as you yourself emphasize in your book—which is the entire euro is essentially a political project. And the question is, how big do we need to push integration in other areas to make it work? And indeed, you know, part of the reason why we are having it is because we want to push integration in other areas. The problem is to do this at a moment when the crisis has left a very bitter aftertaste. MALLABY: So, Isabelle, go ahead, yeah. MATEOS Y LAGO: No, I was just going to rebound on that. I think talking about transfers in a way isn’t helpful because politically it makes it much harder to sell to public opinion, whereas I think what Jeromin and others, IMF as well, have been talking about is much more of an insurance mechanism. I think if we start talking in those terms, it’s politically much more palatable. And it’s true it would be a different system than what you have in the U.S. or in Germany or in Switzerland, where you have a political contract but guess what, nobody ever talks about it. I mean, if you put those numbers out in the press, I’m sure there would actually—(laughs)—be quite a lot of debate, but you don’t. So in Europe it’s going to have to be a different solution. And on this one I have to say I’m a bit less pessimistic than on some of the other issues. There is a—I have a sense that there is increasing recognition that a solution of that sort is needed, including in Germany. There’s a lot of confusion about what form it’s going to take. Obviously, if you talk of, you know, German taxpayers shipping off money to Italy or to the periphery, nobody’s going to be in favor of that. But, again, it’s an insurance mechanism that people have described, or at least some of the proposals are talking about, and I think that’s politically—that would be much more acceptable. MALLABY: But talk to me about the politics here because, I mean, it was said, you know, if we go back, you know, nine months, people were saying, look, you know, we’ve got the French election, the German election; we’ve got to get through that. Once we’re through that, 2018 is the golden window of opportunity to get some of this type of reform done because in 2019 we’re going to face eurozone—European Union elections, we’re going to have musical chairs at the ECB and in—and in Brussels. So 2018, now, is the time to do it. Macron made his big speech at the Sorbonne. He laid out an agenda which includes some of this stuff. Didn’t it just dissolve on impact with German politics? MATEOS Y LAGO: I think maybe it did for a bit, but not fully. I mean, Meseberg had a lot of—had a lot of positive developments. Frankly, it’s the other countries that killed it, perhaps because there was a little bit too much arrogance from France and Germany—I’m French, so I can talk of French arrogance—(laughter)—in sort of assuming the others would happily rubberstamp the plan. But I think, look, to hear a German finance minister talk of a European unemployment insurance, something that makes me very hopeful. So, actually, I wouldn’t be surprised if we did get somewhere on this—on the fiscal capacity at the eurozone level. I think one very big issue around this—and again, it has to do with Italy, and there’s a—politics is a big one—but the other one is, you know, we’re not starting with every country having an ideal debt-to-GDP ratio and an ideal fiscal situation. We’re starting off with one large country, which is Italy, and a couple of small ones that have a debt-to-GDP level today that, you know, could get on an unsustainable path at the slightest shock. And that means they have very little room for maneuver to run an accommodating fiscal policy at any time. And I think that’s making the whole debate much harder to resolve because you—even if politically you would like to say, oh, every country needs to have the flexibility to run countercyclical fiscal policy, when you look at Italy, guess what? You can’t, right? MATEOS Y LAGO: I mean, unless somehow you multiply the growth potential by three or something, but—(laughter)—exactly. MALLABY: This gets to the issue of trust, right? MALLABY: My point is that the lack of trust is not simply a subjective thing that you could fix, it’s actually based on observation of the real condition in Italy. MODY: —and say, you know what, Italy needs a fiscal stimulus—there are no constraints, and we trust that they will do it right—it’s not easy to do it. It’s even technically a very difficult decision. I agree with it, and if I was responsible for Italy I would recommend it, but it’s hard to do a significant stimulus for Italy at this point. MALLABY: So we have discussed things where the glass was half-full. Now we’ve discussed the issue of fiscal transfers. The creation of centralized bank deposit insurance has come up a bit. Another thing is the notion of creating a eurozone-wide safe asset, you know, partly to help finance the central fiscal authority that could do transfers, partly to give banks in Europe a safe asset to hold so that you start to break that doom loop between the banks and the sovereign. Isabelle, you’ve talked a bit about this already. What about a European—a eurozone-wide safe asset? Are you optimistic that that could be created? MATEOS Y LAGO: So no, but that may be—that may be for the better. So let me—let me elaborate on that. The sensible thing to do would be to have a genuine safe asset with joint and several liabilities of all the members. Let’s imagine an ESM—a supercharged ESM that could—that could have unlimited capacity to issue paper on the market. That would be a genuine European safe asset, backed by the balance sheets of all the—of all the sovereigns. ZETTELMEYER: No, no, I’m not a co-author. I just defended it. So a securitization vehicle that would somehow be considered as safe. I’ve written about this, I think, from a private sector perspective. This is a complete nonstarter. And I think the Europeans have frankly wasted a couple of years going around in circles coming to that conclusion. Now, this idea seems to have been buried by the Council, so hopefully we can move on and focus on other issues. MALLABY: Just the cliché view of finance is that the private sector people love securitization structures and complex blah blah blah, and the regulators don’t like it. Here you’re saying the opposite. MATEOS Y LAGO: It’s the opposite. That’s right. It was the regulators trying to push for a securitized product, claiming that it would be declared safe and therefore all the banks should be very happy to hold it. I think one thing we’ve learned very clearly from the crisis 10 years ago was that securitizations are more complex than they seem, and you don’t want to assume safety or declare safety. MALLABY: Now you’re going ad hominem. ZETTELMEYER: That’s right. (Laughter.) No, I mean, you will hear this from private sector people frequently because they are holding out for, you know, the big prize, which would be a publicly guaranteed safe asset, meaning guaranteed by the Germans in some form, and that will never happen. I mean, it’s not even going to happen in twenty years. It will never, ever happen, OK? So what might happen—and here we could start agreeing or discussing—is there is a real question—I mean, you don’t need either/or, right? You don’t need to choose between, you know, joining several guarantees on the one hand and securitization on the other. There’s a sensible thing in the middle, which is you create a European fiscal federalism type thing, and that issues its own debt—not guaranteed by the member states, but guaranteed by its own revenue stream, right? So if we had a euro area budget that would issue euro area debt, we would create that. OK? So this is the one thing that all three of us will probably agree on. So the question, then, is, are we going to wait for that thing? That’s the twenty-year horizon, right? Or are we going to create something in the meantime that might be sensible? And here, you know, basically Isabelle and I agree on the technical—disagree on the technical merits of this thing, but it should—I’ll just say one thing. It is completely misleading to shoot this down by reference to say mortgage-backed securities in the Great Recession. Because here we are talking about a completely transparent assets in which there’s a regulation forcing specific portfolio weights. And the only thing that’s in the cover pool here is sovereign debt, right? So this whole issue of we don’t know what’s in it, we don’t know the quality of the underlying collateral—all this is gone. And this thing is very, very easy to analyze. And the truth is that, you know, if you make the junior tranches big enough, this can absorb virtually every crisis that you can imagine. MALLABY: Well, I think everybody now has understood that, you know, we have a French member of the panel, we have a German member of the panel, and I guess Ashoka is kind of the ornery Italian. (Laughter.) Thank you for playing that role. And we see that, you know, comity and so forth breaks down sometimes. But I think we should move on to a third bucket of issues. So we’ve discussed the stuff where there has been progress, stuff where we hope for progress in the future. Then there are things, sort of new issues that have come up, right? New challenges that were not there 10 years ago, but which are there now. And the obvious one is sort of a crisis of political legitimacy, which I think has become much more obvious with the success of populist and anti-Europe parties across the eurozone. And so I guess one question—and maybe Ashoka could comment on this first—if another crisis were to come, there would be a question of whether voters in the periphery, the debtor countries, would be willing to endure another round of austerity in the way that they did last time without the whole system falling apart. So have we kind of used up that ability to impose austerity, and if it happened again in the next decade, that would be the end of it? MODY: Yeah, certainly I cannot imagine—since you have designated me ornery Italian—a kind of austerity that Greece experienced being imposed on it. MODY: I think it would be politically explosive not just in Italy but it would be politically explosive anywhere. And the problem is that the Italian situation is in many ways worse, several times worse than in Greece. Italy is about ten times larger in terms of financial assets and government debt than Greece was. And the Italian growth rate—Isabelle referred to it very gently in passing—the Italian potential growth rate is something like half a percent or three-quarters of a percent. And so the notion that the Italians will be able to bear this is just completely unrealistic. There are several political problems right now. One is related to the euro. So the euro—in the crucible of the crisis in 2012, what happened was that Europe began to politically fray. The rise of the Alternative for Deutschland Party in Germany and the rise of the Five Star in Italy are exactly contemporaneous events. And in the AFD rises because some Germans believe that Germany is doing too much for Europe, and the Five Star rises because the belief is that Germany is imposing on Europe. That then creates the Five Star and AfD. They then morph into other variations, especially in AfD’s case, into the migration crisis. So you have a multiple set of events, parallel events that are creating a disjunction in politics. On top of that, if you then also create a policy framework—remember, it’s not just the austerity, Sebastian. It is the sense that somebody is dictating to you. That is sort of the most corrosive part of the process. And therefore, the system, politically, is very fragile at this moment. ZETTELMEYER: Just very quickly. So I really want to stress the last point. So there’s a huge difference between Italy today and Greece, right? Greece had a like twelve percent primary deficit even before interest payments. Italy has a primary surplus, OK? So Italy, in order to sustain its debts, does not require a huge amount of austerity. In fact, they may not require virtually any fiscal adjustment on top of what they have already done. They just need to resist the temptation to spend a lot. Still, it is quite implausible that Italy would agree to an ESM program—not because of the harsh conditions that this imposes, but because of, you know, the symbolism of getting conditions dictated by Europe. Because this government was elected to not take orders from Europe, and that’s what makes the current situation so dangerous. So we have actually a safety mechanism that in my view could deal even with Italy, particularly since they do not require a lot of austerity. But it requires a cooperative government, and I’m not sure that that’s the case right now. MATEOS Y LAGO: Well, I think the technocrats are absolutely not going to go out on a limb if they don’t feel there’s political support for what they’re trying to do, be it in the core or in the periphery. But I’d like to say, this issue of the political fraying is perhaps even more complex than you all have said. I’m surprised nobody mentioned the issue of migration, which is frankly causing a major challenge right now to Europe in terms of this trust and this sense that maybe our shared values are not as shared as we thought. And if you look at opinion polls in Italy, this sentiment of being completely abandoned by the rest of Europe in dealing with the migrant crisis has been a major contributor to bringing both Five Star and Lega to power. When you look at sentiment towards the euro, the population is still overwhelmingly attached to staying in the—in the euro. And I think, you know, if you look back to Greece in 2015, Syriza won the election on a platform of saying no to the European bullies, saying no to the—to the Germans. They won their referendum saying no to the program, and then what did they do? They realized, well, oops, you know, we actually do want to stay in the euro, so we have to—we have to swallow the medicine. MATEOS Y LAGO: Well, I think the simple fact that it’s an open question is a big problem because Italy is much larger than Greece, as Ashoka said, and I think, again, it always goes back to this question of what do you do with this phenomenally large debt burden that Italy has—and, by the way, twenty-five percent of which is held in the eurozone outside of Italy. And, you know, there’s always a lot of sense that, oh, wouldn’t it be so much easier if you restructure this debt, but then what does that do to the—to the debtholders. MALLABY: So I want to come to questions from the members in just one minute. But one last thing I’d like to get out there is, you know, we’ve discussed on the one hand progress that Europe has made, but it’s not complete progress; on the other hand, issues which have been discussed but action has not yet been taken; and then a third category of, you know, sort of new challenges that have arisen that weren’t there before; then, finally, is the issue of what’s the flashpoint, what’s the kind of trigger mechanism that could lead to all of this coming to a head. And, Jeromin, maybe I’ll put this one to you. You know, the obvious thing, it seems, is that Europe has been helped recently by a strong global economy. The ECB has been running very loose policy. The oil price for much of this time has been low, which is helpful to Europe. Now oil is going up, the ECB is tightening, the world economy has been great but may not be forever—people are penciling in a recession, potentially, for 2020 in the U.S. when the fiscal impetus goes away. So we’ve got, you know, this slowdown in the European economy you can already see, together with policy tightening and worse external conditions. How much does that worry you? ZETTELMEYER: OK. So the really important thing to bear in mind is that for the stability of Europe, whether the global economy or the euro area economy slows in the aggregate or not is almost irrelevant. And the reason is that the ECB will offset that through its policies. What can kill Europe is divergence of growth inside the euro area. And so here the most worrying data point is that Italy, you know, after a little bit of hope, again seems to be maybe in danger of decoupling to the downside. If this happens for a few more quarters and the ECB does not accommodate that—which it might, right? It might, because Italy is big so it will have an influence on the average. But if we see a situation where essentially the ECB just stays on track in terms of normalization of policies, Italy decouples to the downside, we could really get to the situation that Ashoka describes in his book, which is the one-size-fits-none problem in the euro area. And then what does Italy do in a setting where it has very high debt, not much room for stimulus, and huge distrust from the others to use it, so—the little room that they have? So that’s the situation I’m really worried about. MALLABY: So this coupled with the fact you’ll have a new ECB leader and it makes it hard. MALLABY: OK, let’s go to members for questions. MODY: Can I just elaborate very quickly on that? MALLABY: Sorry. Quickly. Quickly on that. ZETTELMEYER: OK. Second half. OK, got it. ZETTELMEYER: I thought he said second quarter. My mistake. MODY: And so if Italy has a recession in the next six to nine months with an interest rate—a real interest rate that is 2 ½ percent, there’s virtually nothing that the European Central Bank can do at that point to reverse the dynamics because at that point the banks will begin to accrue nonperforming loans, the interest rates will go up further. Italy could very quickly go into a very vicious cycle of low growth and financial instability. MALLABY: All right. Sorry, yes. This is on the record. I see a question back there to start with. Please stand, state your name and affiliation, and just one question please. A couple of remarks just for the audience. We do have a technocratic minister of economy today, and this is holding the point of the deficit not to go above 1.6 percent. We’re going to know in twenty-four hours because that’s when the budget law will be presented. The second thing which is very important, which of course not because I am Italian but provides some element of positive thinking, is that even the Five Star Movement is on its learning curve. So it’s one thing to have propaganda and saying all this about thirty-five to sixty billion—that’s the kind of cost of the reforms they were asking—and everything is to be in government. They are, of course, appealing to their base, but it is the issue of the numbers. And the reason why we are optimistic is because this is external pressure coming from the other nation(s) in the ECB. Italy will, indeed, have to go through reforms. Yes, industrial production has slowed down. Yes, the nonperforming loans are where—you know, they’re not where they should be. But I think that there is a general movement towards more reforms because the last two ministers that we had were technocrats. So there is a bit of knowhow that is building up in the general population, and people know that sacrifices are coming—are coming to an end. Q: So this is to say that Italy has always been—in November 2011, everybody gave Italy ready for Chapter 11. We changed. The thing that is not enough appreciated about Italian economy, only a little bit, is corporate affairs. The stock exchange is a little bit of GDP. The mass is small to medium enterprises, ninety percent. Production is the asset. Export is building. Yes, the current trade war won’t help. But just to give you a little bit of information from the ground. MATEOS Y LAGO: So I heard something slightly different here, which is we’re not going to get a flare-up in the next—well, later this week or in this budget cycle. I think I would agree with that. That’s also our base case. This government is new. Probably right now its top priority is to stay in power. So creating a big financial crisis is not the way to go. I think the question is, how will they handle their downturn? And if Ashoka is right, that could come, you know, very soon. But even if it comes within the year, there’s a downturn, what do they do? Do they do fiscal stimulus? Do the interest rates go through the roof? Does the system—or do they climb down? And I think that’s very much an open question. MALLABY: Another question. Yes, Ben here. Q: Benn Steil, Council on Foreign Relations. I wanted to go back to the question about the political contract. If you go back to the 1990s and the debate about the euro, there were broadly two schools of thought: one, that we needed banking/fiscal/political union to underpin the long-run stability of the euro; there was another school that said, well, that may or may not be a good idea, but all we actually need is a credible no-bailout rule. Now, since the financial crisis, of course, that first school has been in the ascendant. The second school has been at least quiet. But I want to say something in defense of the second school. There are many countries around the world that are dollarized—that don’t have their own currency, that use the U.S. dollar. In our hemisphere, Ecuador, El Salvador, Panama, they went through the financial crisis with nobody talking about de-dollarization. You’ve never had an instance of de-dollarization. Of course, there is no fiscal/banking/political union, but there is a credible no-bailout rule. Nobody actually believes that the United States will come to their defense. Is there something still to be said for the no-bailout principle? MALLABY: Meaning that the north will otherwise want to leave. ZETTELMEYER: Yes. Yes. The populists are directly fed by this notion that the whole no-bailout clause—which, after all, is written into the European Constitution—that this was a big lie, right? And, you know, I wouldn’t say—I think, you know, we had what we call in Germany a notlüge—you know, an excusable lie—because in the end, you know, we needed to bail out Greece. And so it was—it was validated. But it is clear that this cannot happen systematically, right? It’s also clear, in my view, that no fiscal rule, no matter how much you reform it, is going to prevent a potential crisis in the—in the future. But the trick is that it’s so much harder to make this credible in the euro than it is for El Salvador, right? And so what we have in our report is effectively a strategy to make it credible, and that involves first and foremost shielding the banking system from the consequences of sovereign debt restructuring because the only way you can make it credible is to say in extremis, right, we don’t want this. And we do not think—I do not think that Italy requires a restructuring now. I want to go on the record for that, OK? But to make it in principle credible, you need the possibility of a restructuring. And to make that happen, you need a ton of risk-sharing because only then is the restructuring not so painful that you would never want to go with it. And so that was the long answer to getting to the point that even though I am a big believer in the no-bailout clause, I don’t think it can be implemented without taking some from the first philosophy. So I think your two philosophies are really not either/or. I think the right way of thinking about it, since I have my German hat on today, is the no-bailout clause. But I think a clever German who doesn’t want bailout has to acknowledge that we will need risk-sharing to make it credible, right, which is why we need the first part of your agenda too. MALLABY: Another question. Yes, right here. Q: Yes. Thank you. Joe Naggar with Golden Tree. I guess two areas I was surprised you didn’t touch. One is just, you know, U.K. and Brexit, and sort of the risks posed there. (Laughter.) And then—maybe it’s not a risk. And the other one is just sort of the upcoming parliamentary, you know, elections and the kind of ECB, you know, Draghi, you know, changing—changing Draghi. MALLABY: So, OK, those two things, I guess the eurozone—the Draghi change, but also the European Union elections. I’ll say one quick thing on Brexit and we’ll pass to Isabelle, maybe, for the switch in leadership in the eurozone. So, on Brexit, it seems to me that after last week, when the Salzburg summit went badly, you know, the odds of a bad outcome by March went up. I think the base case is still that, you know, Theresa May, for all her robotic clumsiness, manages to get a fudge which kicks the can down the road on the difficult issue of what kind of trade relationship exists between Britain and the European Union. That will be—there will be a kind of political declaration, blah, blah, blah, and that will be negotiated later. What they’ve got to fix before March is a deal on Ireland. You know, they failed to do that because there is a hardline group of members of Parliament from Northern Ireland on whom Theresa May relies for votes to keep her government together, and they are absolutely refusing any sort of reasonable fudge that would allow customs checks in the Irish Sea between Northern Ireland and mainland Britain, which is the obvious solution to this issue. But I think it’s clear that there will be some sort of fudge. Those people will have to be rolled. Then the interesting thing is Theresa May comes to Parliament with this fudge and says here is the divorce deal from Europe; we’re going to negotiate the trade details later; vote for my divorce deal. Whether she gets that through or not is a tricky question because there are people within her own party who would prefer Remain as an active movement, to get a second referendum going. The base case is I think she squeaks through, but there must be a twenty percent chance that there’s some kind of breakdown, and then who knows what might happen. It could be another election. It could be another referendum. It could be that we crash out. I think it becomes very hard to predict after that. MATEOS Y LAGO: On the ECB? MATEOS Y LAGO: Sure. I mean, on Brexit, I agree a hundred percent with what you just said. On the—on the ECB, I think in an ideal world what you would like to happen is for the European leaders to say here’s the kind of role we want the ECB to play in the future in running economic—its part of economic policy in the system, and we’re going to interview a bunch of candidates and see which one is closer to that philosophy. The odds of that happening are close to zero, and instead we’re going to have a discussion around passports and gender and this or that form of diversity, and who knows what will come of it. And I think that’s a real issue, that we will not know until the next crisis, probably, how the ECB will behave when the time comes. I think that’s unfortunate. I hope I’m wrong and that we’ll see more of a discussion of, you know, how active should the ECB be in helping the European—in helping the eurozone have more convergence and perform better as a monetary union, but I fear we won’t get that. MODY: If I may just add on that, in my view I believe less in the personalities of it here. I believe that the ECB operates under very severe political constraints, and the ECB at this present moment in time has reached its political limits. The QE is being withdrawn, not because there is a reason to withdraw it; growth is slowing down, inflation is stubbornly stuck. A normal ECB would at this time—just like the Bank of Japan is bumping QE, even though the Japanese economy is doing better than the eurozone economy—the QE would last for a much longer period of time. But because the ECB is buying bonds of different countries, some of which are riskier than others, there is always the potential that there might be some defaults, which will cause losses. And so the ECB, in my view, has prematurely declared victory, and that is—that has nothing to do with Draghi. That is to do with the fact that it is a central bank of a diverse group of countries with very different political interests. Q: (Off mic)—for your insight. You have answered one question I came here with, which is where are the risks of a new crisis. And it’s clear it’s Italy—(laughs)—which I’ve heard from other European observers. You mentioned at the very beginning but didn’t come back to the banks. I’d like to hear about the possibility and the form in which the stress that starts in the banking system would take. Thank you. MALLABY: Ashoka, do you want to talk about that? MALLABY: OK. (Laughter.) You’re welcome to do that if you’d like to. MODY: Do you want to take it? MALLABY: Maybe this is for BlackRock here. MATEOS Y LAGO: So the banks—well, the banks in Europe are still not in great shape. You have about a hundred billion euros of NPLs in aggregate on their—on their balance sheets, so that’s not a great condition in which to enter the next—the next downturn. As we’ve said before, we’ve got—we’ve got better supervision, but that’s only for the largest ones. The smaller ones are still in a bit of a—not a no-man’s land, but let’s say looser supervision. And then, thirdly, as in—as is the case in the U.S., the policymakers, in reaction to the bailouts of the last crisis, have decided to tie their hands significantly in terms of their ability to solve a problem, such that, you know, if, say—I don’t want to name names, but the largest German bank—(laughter)—had run into trouble, you know, eight years ago, it’s pretty clear what would have happened. Today it’s not. And the only certainty is that—is what it’s not allowed to do. But in terms of exactly what can the system, the authorities, do, we don’t know, and that’s probably a recipe for taking longer than it should to resolve the problem. So I would say that’s my worry. That’s a system that is a little wobbly to start with. It’s in better shape than five years ago, no doubt. The NPLs have gone down. I don’t want to be too alarmist. But it’s a system that’s fundamentally not as strong as the—as the U.S. one, that is—still needs to go through a lot of consolidation. This consolidation is, unfortunately, not happening on a cross-border basis, which would be the better way of doing it. It’s not happening because national regulators are penalizing the banks that want to do this on a cross-border basis. So, frankly, this is all, you know, not terribly encouraging. Again, I don’t think it’s—as long as growth holds up, it’s not a risk. But when growth slows down, I think it’s as likely that the problem will start from the banking side as from the sovereign side, perhaps even more likely. MALLABY: Me too. Yes, a question there. Q: Ed Cox, New York State Republican Party. I’ve heard the words for solutions, whether temporary or permanent, of austerity, stimulus, restructuring. The Italian gentleman mentioned another word: reform. We would say deregulation here in the United States. What role does reform or deregulation have? And how it is implemented in the process of finding a solution? MALLABY: So that is something on the list of things that, you know, Europe has made some progress on, which I skipped over. But, Jeromin, do you want to comment on that, or? ZETTELMEYER: Yeah. So I think that like you probably meant, I mean, the big success story in that respect is that France is doing reforms, which about two years ago would have been thought of as inconceivable, right? Germany actually needs to do quite a few reforms. So my job when I was in the Ministry for Economic Affairs was to push for that, but there was a huge sense of complacency. And the rest of Europe seems to also think that, you know, apart from liberalizing its services sector, which everyone agrees on, Europe is—Germany is, if anything, too competitive, so they better don’t do reforms. I think that’s stupid because we have a long-run issue that has nothing to do with Europe and the euro area; it has to do with China and sort of our position in the world economy. But then there is the—and Spain has kind of, you know, been OK, generally. I think Greece has done under a reform-phobic left-wing government more reforms in the last two or three years than they did under right-wing governments before that. So there is actually quite a good—lot of good stuff going on. Again, the outlier a little bit is Italy. So Italy did some reforms under both Mario Monti and Renzi. There are—you know, these reforms have been controversial. So Ashoka will probably explain to you why they have done more harm than good. The question really is, to what extent can the type of reform that you have in mind as a Republican address the real deep-rooted problems of a country like Italy, which have to do with institutions, the judiciary, corruption, and maybe not so much regulation. I actually agree with you that on product market regulation Italy still needs to do a lot. So there is sort of an intersection between, I think, the relevant reform agenda, what you have in mind, that’s very important, but it’s probably not the number-one problem in Italy. MALLABY: I’m glad you brought up China because it does seem that, you know, if you take high-tech, AI, you know, that’s where—if you think about Europe’s future, the past was underwritten by a set of extremely competitive manufacturing companies—German cars, machine tools, and so forth, quite a lot of French strength in sort of big infrastructure and so forth. If you think about the next generation and what high-tech means, it feels as though Europe is less well-positioned in artificial intelligence, which is basically a game of aggregating data, with two big players—the U.S. and China—battling it out and Europe really not on the map. MODY: Yeah. If I may just add to both of what you said, remember, Europe is a declining continent. It’s a declining continent economically, and it’s declining at a speed that is extraordinary compared to the United States and especially compared to Asia. So if you look at patent statistics, in 1995, the Koreans patented about half the amount the Germans did. Today they’re almost double. Behind that lies a huge R&D infrastructure. Behind that lies an impressive educational structure. China today is—does more patenting than France does. Again, behind that lies research and education. The East Asian economies are powering ahead not because of what Europeans call reforms, but because they invest in education, research, and innovation. That is where the future lies. Oddly enough, despite all its strengths, Europe has failed to invest for almost a generation in these. European education levels are falling behind the rest of the world, and European universities in particular are falling behind the rest of the world. So Europe is—you know, labor market reform, which is sort of the sort of standard reform in Europe, which is, you know, making it easier to fire workers, yes, that will do something. But what Europe needs is a Marshall Plan-like investment in education and innovation. And there is—that is a domestic challenge. That is not a eurozone challenge. Each country needs to do that. But if they don’t, then the superstructure of a bad macroeconomic structure of the eurozone imposes huge costs on Europe as a consequence. MATEOS Y LAGO: Yeah. I mean, I don’t want to overdo the negativity about—around Europe’s decline and inevitable bust-up down the road. I mean, Europe, you know, has had higher real wage growth than the U.S. since the crisis. It has—it has higher life expectancy than this country. It has educational achievement that it’s true has been stalling or declining in some countries, but remains high. So I think the question is, how do you preserve these accomplishments going forward? We shouldn’t negate them completely. I think the trouble with structural reforms is, again, they are—right now the competency for most of them is at the national level, and most structural reforms are unpopular. I think now we’re seeing a switch in those countries, like France, that have elected pro-European governments. There’s a switch to this slogan of the Europe that protects. That’s been, in fact, adopted as the slogan of the—of the Austrian presidency. And I think as part of that there is this sense—and also thanks, frankly, to President Trump—this sense that, look, we need to rely more on ourselves going forward. We need to roll up our sleeves and start assessing, you know, what is it going to take for Europe to stand on its own two feet. And that’s true in terms of global, you know, financial infrastructure, you know, how to escape the secondary sanctions on Iran and the like. That’s true in terms of defense. That’s absolutely true in terms of technology. But we’re at the very beginning. So I think the good news is Europe is really waking up. And I’ve seen this in—you know, whenever I’ve been in Brussels or anywhere on the continent in the last couple of months. But it’s the very beginning, so we’re going to have to see where that goes. I’m hoping this will be an issue in the upcoming European elections and that can give some momentum for the next Parliament and Commission to really give a big push to these issues and, frankly, adopt a common strategy. This seems to be going against the wind, but frankly, where Europe is strong is on competition policy, where it’s acting at the European level; it’s on monetary policy, where it’s acting at the European level; now on banking supervision. So I think there’s a strong case on some of these issues for moving the initiative to the European level. But we’ll see. MALLABY: I’m going to ask you each to give a one-sentence answer to a final question and then we’re going to wrap it up. If you had it to do all over again, would you want to create the single currency? Jeromin. MALLABY: Yes. OK, that’s quick. MATEOS Y LAGO: Absolutely yes. MALLABY: Absolutely yes. OK, two to one. (Laughter.) Only the Italians disagree.